Grilled pizza: a delicious take on the brick oven favorite. Photo courtesy J.M. Smucker Company. This pizza recipe was a finalist in the 2009 Crisco Grilling Hall Of Fame Contest. This is Page 4 of a 15-page recipe series. Click on the black links below to view other pages. You can read more about the contest on Page 1. You don’t need a brick oven to make a great pizza. You can do it on your grill! Serves 8. Preheat oven to 450°F. Cut the garlic bulb(s) in half across the cloves, spray halves with the Crisco cooking spray, reassemble the bulb(s), wrap with aluminum foil and roast in the preheated oven until the cloves are soft (about 1 hour). Unwrap and allow to cool. When cool to the touch, remove the cloves and mash with a fork in a small bowl. Heat 1 tablespoon of the oil in a sauce pan over medium heat. Add the shallot and sweat until soft (about 3 minutes). Add the 2 remaining tablespoons of oil and the roasted garlic, stir to combine and cook for 1 minute. Add the tomato paste, stir to combine and cook for 1 minute. Add the dried basil, dried mint, 1 teaspoon kosher salt, 1/2 teaspoon black pepper and crushed red pepper flakes; stir to combine, and cook for 1 minute. Add the water, stir to combine and simmer for 10 minutes. Preheat the grill over medium heat and coat grill racks with the cooking spray. Coat shrimp liberally with cooking spray and toss in a bowl with garlic powder, the remaining 1/2 teaspoon kosher salt and the remaining 1/2 teaspoon black pepper. Grill the shrimp until it turns opaque and begins to curl (about 2-1/2 minutes per side). Transfer the shrimp to a cutting board and slice in half, lengthwise. Cover with foil to keep warm. With a pizza cutter or sharp knife, divide the pizza dough into 8 equal rectangles. Recoat the grill racks with cooking spray. Grill the pizza dough in batches of 4 until the tops are puffy and the bottoms are golden brown with distinct grill marks (about 4-6 minutes). Spray the tops of the pizza crusts with cooking spray. Flip the pizza crusts and grill for an additional 1 minute. Continue until all 8 pizzas are well-grilled on one side and partially grilled on the other. Set out the pizzas on parchment paper or wax paper on a countertop with the well-grilled sides facing up. Divide the roasted garlic sauce evenly among the pizzas. Divide the Cheddar and mozzarella cheeses evenly among the pizzas. Divide the shrimp, cut side down, evenly among the pizzas (5 shrimp halves per pizza), pressing the shrimp lightly into the cheese and sauce. 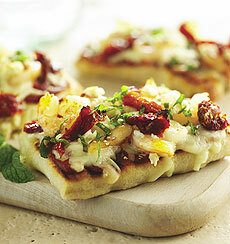 Divide the feta cheese and sun-dried tomatoes evenly among the pizzas. Return the pizzas to the grill, in batches of 4. Close the grill lid and cook until the bottom sides of the pizzas are golden brown and the grated cheeses are melted (about 4-6 minutes). Continue until all 8 pizzas are cooked, keeping completed pizzas on a platter, loosely covered with foil. Divide the fresh mint among the pizzas. Cut the pizzas with a pizza cutter or sharp knife and serve.